Brigette Bardot shows off in a mini-dress and really cool boots. 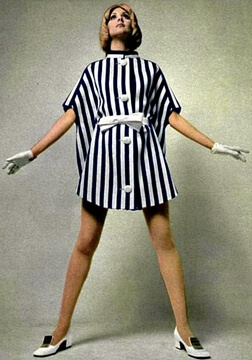 The 1960s marked a very important stage in the evolution of twentieth-century fashion for two reasons: because the youth market demanded and got their own styles; and because the notion of anything goes in fashion became the norm. The mini skirt or dress was at the epicenter of this evolution. Mini’s created a revolution and turned 1960’s fashion on its head. By the late sixties no boundaries remained for the designers as to what could be done with the mini. Women were liberating themselves from the uncomfortable and matronly apparel of the fifties. Armed with synthetic materials, new female designers and ready to wear affordable designs the mini was ready to explode onto the sixties market. Aided by the invention and commercialization of pantyhose or tights, women were proudly showing off not only their legs but their freedom as well. 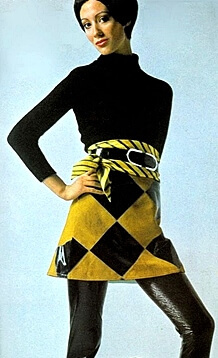 Although French designer Courreges claims to have invented the mini, there’s no question that Mary Quant working out of her small King’s Road, London boutique popularized and gave mass market appeal to the mini. Mary’s designs were simple usually using a basic A-line design for many of her mini-dresses. After the successes of Quant, Betsy Johnson, Barbara Hulanicki and other young female 1960’s designers, all of the major Fashion Houses followed suit. 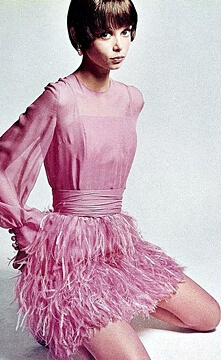 The likes of Chanel, Dior and Y’ves Saint Laurent were soon offering the shorter mini styles in their couture lines. Not as risque as what was coming out of swinging London it definitely emphasized the importance of the mini skirt as a new style icon. Although the even more liberating pants suit style of clothing would gain popularity in the early 1970’s and eventually edge the mini skirt out of vogue, the remnants of that 1960’s fashion revolution are still visible in today’s clothing.